Whether you're looking to spruce up your current website or have a whole new project in mind, we can help you. We've helped clients tweak existing projects so they work how they should. We've built entirely new systems from the ground up and everything in between. If you're sounding out an idea and just want rough prices or you're ready to go and need a detailed quote. We are always happy to have a chat, no charge, no obligation. With the smartphone and tablet revolution, people don't just use their desktop computers. We use the latest coding and best practices to make sure your site works seamlessly on all devices. All our websites are search engine optimised, to reach the widest group of visitors. We can help you understand how the search engines read your content and help you get the most out of your website. No logos? No problem! We can help design and supply artwork for your site. Supplying you with appropriate artwork files for professional printers, brochures, headed paper, or for in-house printing. We'll also help you craft the words, pictures and other content you need to show the world who you really are and get it translated too, if that's what you need. Looking to tie your website into your social media accounts? No problem, we can integrate your site with Facebook, Twitter, LinkedIn, Instagram, Digg, Google+... the list goes on! A website isn't just something you build and file away. It's a living, breathing window directly into your business, letting your customers see what you offer and giving you unique insight into what interests them. Full statistics and detailed analytic reports are set up as routine on all sites, to help you understand what's trending on your site. No problem. We can use any payment system available. Our handmade approach means that whether you need a shop with all the bells and whistles or just a simple checkout, we can build the right one for you. We can take the pain out of CMS websites. With each site hand built for your needs, we can make the update interface straightforward, simple and just the way you want it. Updating your website couldn't be easier. Do you need your website to communicate with a database, datafeed or another server? We work with lots of different systems, languages and methods. Broad Haven Holiday Park website was developed to showcase their stunning caravan park in the beautiful and picturesque setting of Broad Haven, Pembrokeshire. 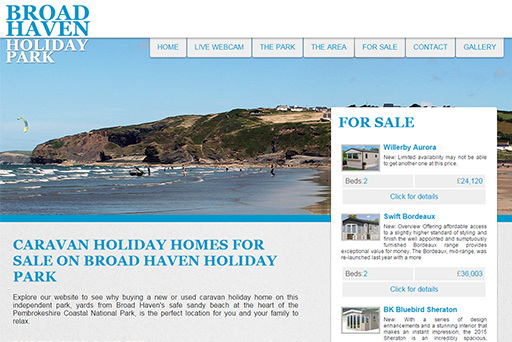 www.broadhavenholidaypark.com was created to be fully editable by the client, allowing any new details, caravans for sale, park or local details to be updated on demand. We also developed a small database to help Broad Haven Holiday Park with their day to day management for utilities and ground fees. The Pembrokeshire Beach Food Company wanted an online presence for their beach shacks and also a place to peddle their seaweed delights. www.beachfood.co.uk is HTML5 (smartphone-friendly) website. 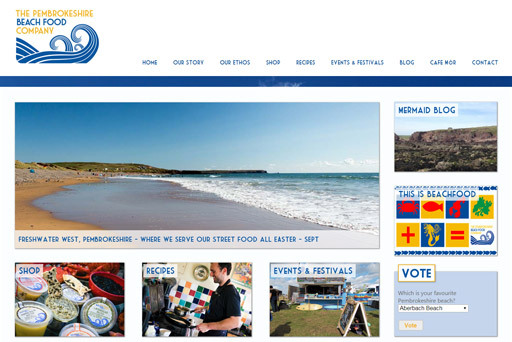 It has an online sales section and the website is fully Updateable by the client, helping them keep their customers up to date with all of the latest products, events, recipes and general news from The Pembrokeshire Beach Food Company.